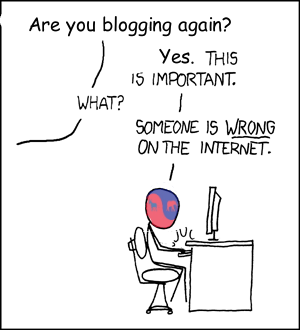 Welcome to the 54th edition of the Carnival of Divided Government - the Special "Back and Blogging!"Edition. NOTICE: The Dividist hereby retroactively announces that the Dividist Papers Blog will be taking a six week Blogging Sabbatical effective at the conclusion of the Facebook IPO post six weeks ago. We did not know we were taking a six week hiatus at the time. It just sort of happened. NOTICE: The Dividist has returned from our recently announced blogging sabbatical. We are back and we'll kick off with this slightly late edition of the Carnival of Divided Government. Nothing gets those blogging juices flowing like reviewing and correcting the misrepresentations, misunderstandings and general ignorance about the nature and value of a divided federal government. Somebody has got to do it. If not the Dividist, who? If not now, when? As explained in earlier editions, we have adopted Latin ordinal numeration to impart a patina of gravitas reflecting the historical importance of the series. In this the Carnival of Divided Government LIV (Quattuor et Quînquâgintâ), as in all of the CODGOV editions, we select volunteers and draftees from the blogosphere and main stream media writing on the single topic of government divided between the major parties (leaving it to the reader to sort out volunteers from draftees). Professor Stevens either does not understand the definition of "divided government" as used by Professor Fiorina, or deliberately misstates his thesis. Fiorina never said that the divided government pattern he predicted means "Republican presidents and Democratic Congresses". He used the conventional political science definition of divided government as any mix of the Executive, Senate, and House branches not controlled by a single party. So the example she cites of Republicans retaking Congress in 1994 with a Democratic President actually does not refute but supports Fiorina's contention and prediction. That particular election was a restoration of divided government after the short hiatus of Democratic One Party rule in the first two years of the Clinton administration. Interestingly, we may be repeating this pattern in the current administration. Assuming that Barack Obama is reelected, divided government will likely hold sway for six of the eight years of his presidency, as it did during the Clinton administration. Professor Stevens may be correct that Political Scientists are lousy forecasters, but Fiorina would have to be considered the exception that proves the rule. "One critical factor affecting the expected lame duck session will be the outcome of the presidential election, Davis said. "Obviously if the Republicans take the presidency, the House, and the Senate, on the Bush tax cuts they'll wait to do something through reconciliation, and do it their way instead of trying to compromise their way through it," he said. "But if you have continued divided government, they may get together and try to get some of this stuff off the table, figuring that they're going to have to live with each other at least another two years." After all the hand-wringing about the "fiscal cliff" being unavoidable, Cook lays out the very scenario averting the "fiscal cliff" that is most likely to happen. Legislators are laying the ground work now, including turning Simpson-Bowles into legislative language. The election may move the needle on the specific percentage of tax increases vs. spending cuts, but the general shape of the legislation and size of the breadbox was determined by Simpson-Bowles. Compromise only happens when politicians are faced with no other alternative. There is no alternative to compromise if we are to avoid the "fiscal cliff". Hence we will see a compromise emerge before the end of the year. Which is to say - the experts will be wrong again as the fiscal cliff is eminently avoidable. "The United States will thus spend significant periods of time with divided government. And the rise of polarization and the associated decline in congressional moderates means that the harm from such periods is likely to be higher than in the past, since divided government was less debilitating when the center in Congress was more heavily populated. We need not, however, lose all hope, even with divided government. After all, and however improbable it seems right now, it's possible that the drama of early 2013 will produce an agreement that avoids undue immediate fiscal austerity while modestly reforming the tax code and entitlement programs... In the grand negotiation to come (assuming that Obama and the House majority win re-election), supporters of the Obama Administration correctly note the leverage the administration will have because all the tax cuts are scheduled to expire at the end of 2012. Note that if the middle-class tax cuts had been made permanent in 2010, this leverage would not exist, and the Administration would thus be facing another debt-limit dynamic similar to the one it faced in the summer of 2011. With the tax-cut expiration, by contrast, each side has leverage over the other--a fundamentally different dynamic, and one more likely to force both parties to the table." Shorter Peter Orszag: Divided Government is bad because there are fewer liberals in Congress and it is less likely that Congress will pass "significant" (by which I mean left-leaning) legislation. However, let me spin some delusional scenarios whereby liberal policies may yet prevail. The reality is that a compromise will be forced because both parties agree that plunging the economy headlong over the fiscal cliff is just not a good idea. After the makeup of the likely 2013 divided government is determined in November, the path will be cleared for a lame duck compromise that will satisfy neither political wing, nor Peter Orszag, but will steer us clear from the "fiscal cliff". The single biggest risk to a lame duck compromise will be if the Republicans win the Presidency and the Senate. If they are able to restore One Party Republican rule, there will be no appetite for compromise and no urgency to act before the new president and congress are sworn in. That said, Orszag's essay is an interesting read and deserving of a more detailed deconstruction. The Dividist will revisit this article in a future blog post. Stay tuned. "The strongest evidence that sub-par growth — or worse — tends to coincide with divided government in presidential cycles comes from the one cycle in this span that featured unified government. With the recovery flagging in early 2003 and President George W. Bush determined to avoid the same one-term fate as his father, a GOP Congress helped him apply the fiscal accelerator." The article features an interesting 20 year bar chart that illustrates Jed's correlation of slow growth with divided government elections and the (count 'em) one single data point he uses as evidence of unified government elections leading to higher economic growth. Notably absent in this analysis are other potentially related events that might also have impacted economic growth over the period in question. Events like the Dot Com Bubble, the Dot Com Bust, the 9/11 Crash, the Subprime Real Estate Bubble, the Subprime Real Estate Bust, and the related near collapse of the entire global banking system. Undoubtedly, Jed is right and divided government elections had a bigger impact on economic growth than any of those other events. "The likelihood is high that the election will come and go without one party taking control of Congress and the White House. Thus, November will resume with divided government and about six short weeks until taxmaggedon. Lawmakers will probably come up with some short-term fixes that push the fiscal cliff deeper into the new year, risking the kind of white-hot showdown that hit the economy during the debt-ceiling confrontation. That could have disastrous consequences. It is all but inevitable that [the uncertainty index] will increase sharply as the debate surrounding the tax cuts heats up," wrote Kevin Hassett, an adviser to GOP presidential candidate Mitt Romney and a scholar at the American Enterprise Institute, in May. "When it does, uncertainty will likely break the all-time record set last year, which could easily take a percentage point or two off of top-line GDP growth." Because knowing who to blame is almost as good as solving the problem. Right? “From at least James Madison’s point of view, this is really how it was expected to work out,” said Steven Smith, who heads the Weidenbaum Center on the Economy, Government and Public Policy at Washington University in St. Louis. “Each institution will end up having somewhat different interests and assert them,” Smith said. “In due course, these questions were to be settled by the Supreme Court ... and the court ends up being a pretty important arbiter of these disputes.” Smith noted that branches tend to clash more under divided government, such as what currently exists with a Democrat in the White House and a Republican-controlled House... "
"It is in vain to say that enlightened statesmen will be able to adjust these clashing interests, and render them all subservient to the public good. Enlightened statesmen will not always be at the helm... The inference to which we are brought is, that the causes of faction cannot be removed, and that relief is only to be sought in the means of controlling its effects. If a faction consists of less than a majority, relief is supplied by the republican principle, which enables the majority to defeat its sinister views by regular vote. It may clog the administration, it may convulse the society; but it will be unable to execute and mask its violence under the forms of the Constitution. When a majority is included in a faction, the form of popular government, on the other hand, enables it to sacrifice to its ruling passion or interest both the public good and the rights of other citizens. To secure the public good and private rights against the danger of such a faction, and at the same time to preserve the spirit and the form of popular government, is then the great object to which our inquiries are directed." One party rule, whether Democrat or Republican, undermines the constitutional checks and balances envisioned by James Madison and the founding fathers. If some independent voters, even if they only represent a few percentage points of the electorate, vote consistently to maintain divided government, our constitutional checks and balances are reinforced and strengthened. "Why do I think independents will tilt slightly in favor of the court ruling and, in turn, the act now? Here we get to what matters to these voters. What matters to them is having one party check the other. 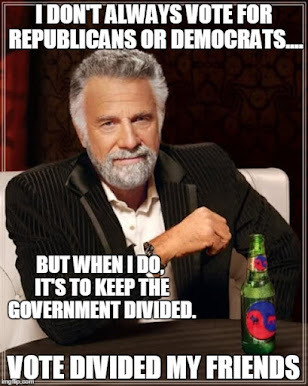 Independents always, for example, want divided government. And they like it when one party checks the other. That's what they want to see, so that each side's excesses are curtailed by the other. To people with strong ideological commitments, this is dysfunction and paralysis, and the thing that pisses us all off to no end. To swing voters, it's reassuring." The Dividist could not have said it better. The argument that divided government is safest also has a distinct downside: paralysis. That “safe” argument under the present state of affairs has outlived its usefulness and is downright dangerous to the continued existence of a prosperous and free nation." Wrong. The argument for divided government is not that divided government is "safest". The argument for divided government is based on empirical historical evidence showing certain predictable outcomes can be expected under divided government. These include: restraint in the growth of federal spending, greater fiscal responsibility, fewer and shorter wars; greater protection (slower erosion) of civil liberties; more oversight of both the legislative and executive branches; and reinforcing rather than undermining the constitutional checks and balances among our separate and equal branches of government. If you support these policy objectives, divided government is a means to achieve them. 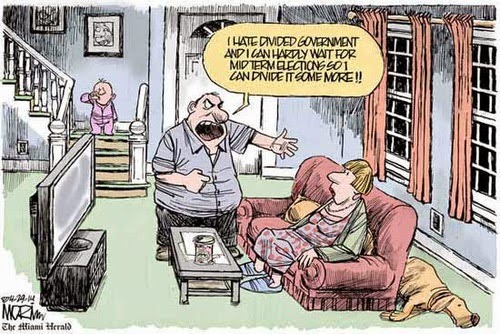 The Dividist is amused to see a Tea Party supporter make the identical arguments against divided government as we heard from Progressive Democrats in the run-up to the 2010 mid-terms, to whit: Our problems are just too great right now to risk all that messy divided government dysfunction. We need strong unified leadership in Washington that can just get things done. Besides, the other party is out of step with the American people and are thwarting the will of the majority. Of course, the policies that liberal Democrats felt we needed to "just get done" then are vastly different than the policies Tea Party Republicans like John Bell feel we need to "just get done" now. Moreover, to the extent that the majority "faction" indeed represents the majority, it holds a very small plurality over the large minority they hope to steamroll with the polic ies that must "just get done". In both cases, the call for one party rule can only be understood as a call to short circuit the very protections on government overreach that is the core construct of our Constitutional checks and balance. As one who purports to represent the Tea Party and constitutional values, John Bell should know better. "The observations and opinions upon which our view is based are outlined below... The U.S. economy and financial markets have outperformed most of the world, thanks to our divided government's inability to similarly punish its domestic economy." "If in the run-up to the election a continuation of divided government starts to appear more likely, we believe that the market will come under pressure. At the very least, absent a clear consensus coming out of the election, November and December are likely to be marked by heightened volatility as investors grapple with the odds of a last-minute compromise." Over the years, the Dividist has blogged extensively on the attitude of investors to divided government. We have consistently maintained the belief that any attempt to correlate political parties in power with stock market performance over the long term should be taken more no seriously than the Hemline Index or the Super Bowl Indicator. Nevertheless, the perception of the investor class can indeed have a short term "self-fulfilling prophecy" impact, and may even serve to predict election outcomes. The Dividist's current sense is that investors cannot decide which is worse - continuing divided government or Republican One Party Rule. The outcome investors fear the most - Democrat One Party Rule - is considered extremely unlikely and completely discounted as a possible outcome of the 2012 election. "This innovation – the ‘Valley View’ that Sameer talks of – is what will drive our economy forward. I firmly believe that these innovations will overcome and, eventually, obsolete the malpractice taking place in Washington and other traditional seats of power – and will create opportunity and economic growth beyond what we can imagine today. So I am bullish – and optimistic – on the ‘Valley View’ – even while I remain extremely bearish on the ‘DC View’. For the sake of my kids and our future generations, I hope I’m right – and am going to continue to do everything in my power to bring that future closer. Yes that does include working for change in Washington. However, since neither party has proven its ability or willingness to act responsibly when in power, at this point I’m of a mind that the best thing that can happen is for us to wind up with a divided government. With luck, DC will tie itself in knots and do as little harm as possible while the innovation economy takes over and drives the growth that we so desperately need." Nicely said Chris. And welcome to the Coalition of the Divided. With that we conclude this edition. Look for the 55th Edition of the Carnival of Divided Government Quînque et Quînquâgintâ (LV) - Special Dog Days of Summer Edition - sometime on or about August 15. Please submit your blog article at the carnival of divided government using our carnival submission form. NOTE: The blog carnival website/database seems to be down a lot lately and we are not sure if it will ever come back. As an alternative, please submit prospective on-topic blog posts to: mw at dividist dot com. I was expecting you to do a special "divided & balanced" post for "go braless day"
An excellent idea, but apparently Google does not recognize this as a national holiday, as it did not appear in my google calendar. Maybe next year.